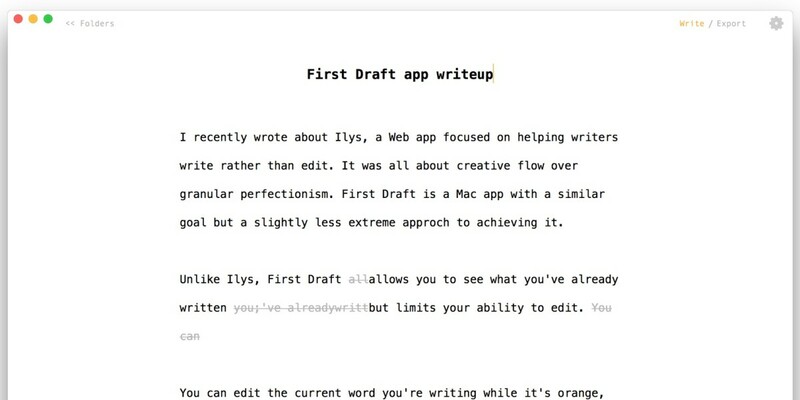 I recently wrote about Ilys, a Web app focused on helping writers write rather than edit. It was all about creative flow over granular perfectionism. First Draft is a Mac app with a similar goal but a slightly less extreme approach to achieving it. Unlike Ilys, First Draft allows you to see what you’ve already written but still limits your ability to edit. You can edit the current word you’re writing while it’s orange, but after you’ve pressed the space bar, any edits will be marked by strikethroughs in the text. The idea is that writing on a computer should be more like writing on paper. A backwards step, perhaps, but if you’re composing something where imagination is key, it’s often helpful to just get ideas down and edit later. A useful addition to the app is the ability to add labeled placeholders for images, videos and other embeds you may want to add later. The idea here is that searching for the perfect image can distract you from your creative flow. Using First Draft is very much about that – composing a first draft; you’ll have to export your work elsewhere for fine-tuning. While the app itself is free to download, the export function is available as an in-app purchase costing $15. Once you’ve paid up, you’ll be able to save your draft as a .txt file, copy it to the clipboard or print it. Using First Draft, I didn’t feel it gelled perfectly with the way I write. But that’s the beauty of writing – everyone’s different, so maybe you’ll feel like it’s the perfect way to get your ideas into text. It’s free to download and try, so you have nothing to lose.